This past weekend as my husband Mac and I went off to bike in the beautiful canyon, Mac turned the radio on to NPR in search of one of his favorite Saturday radio shows "Wait Wait Don't Tell Me". But instead, we were instantly transfixed by another segment discussing media theorist Marshall McLuhan and how digital media is shaping not only our lives, but also our perception of time. We were so intrigued by this topic that we actually got to our destination and sat while continually listening nodding our heads to the fact that what Douglas Coupland mentioned referring to this topic was spot on, "Hi, I'm your cell phone and I'm messing with your sense of time." Have you ever stopped to wonder what happened to the last seven months? It is almost August and I don’t know where the time has gone! Is it the same way for you? Coupled with baby numero duo, (babies can seriously mess up your time reference) I am amazed at how we are in the midst of a serious fast-paced information evolution that is unfolding before our eyes! Exciting, but maybe a little frightening too? What do you think about this digital and social media heavy span that may be distorting our perception and reality of time? What do you think it will unfold for the future? Ironically along the subject of time, the past several weeks I have been analyzing where my time is fleeing off to! I wanted to share with you a few of my favorite time management apps that I narrowed down to five, being either super functional and/or well-designed. Please share your favorite time management apps and tricks too, I am curious as to what you are using! 1: Wunderlist : I downloaded Wunderlist about a month or two ago for free. Currently it is my favorite to-do list of choice probably due to the fact that it is minimal, pretty and the best I’ve come across that works. Daily I enter all of my tasks sorting them into my personalized lists and it instantly syncs with my phone. There is an instant productivity feeling about checking (or.. clicking) off lists, huh?! Why I like it: It is simple, well-designed, functional and user-friendly. I've tried a gazillion to-do list apps and this program strikes the perfect balance and just works really for me. Why try? It is free! It is available for Apple gear, Android and Windows users so pretty much everyone can try it out if they would like. 2: Pomodoro Technique : The Pomodoro Technique is the classic tomato timer approach that has been around for over 30 years. I’ve been experimenting and revisiting the practice for the last few weeks. I create my to do-list (in Wunderlist) and then attack it in 25-30 minute sometimes 60 minute increments with an alarm (Since Pomodoro doesn’t have an official app, I use the PomodoroPro App on my phone, but you could easily just use a timer). Why I like it : It makes large tasks very manageable, it helps me put concrete limitations on things such as email time allotment, and work or household related tasks. It helps me focus better. Why try? It is free and a system that pretty much anyone can implement for even a day to see if it works for them. 3: Sleepyti.me bedtime calculator: Sleep especially since India arrived is usually on the back burner, but I am really working on getting better sleep because especially when you do without it for so long, you realize how many wonders a good night’s sleep really is! I love this little sleep website that calculates when you should wake up. It shares that a good night’s sleep consists of 5 or 6 complete sleep cycles. Simply plug in the time you desire to wake up or click the zzz button and it will help you wake up at the optimal hour to feel refreshed. Why I like it : It seems to make a bit of a difference in my morning grogginess levels, I don't feel as tired. Why try? It is a free website that I have bookmarked on my phone so if you don’t have a smartphone just go to the website. 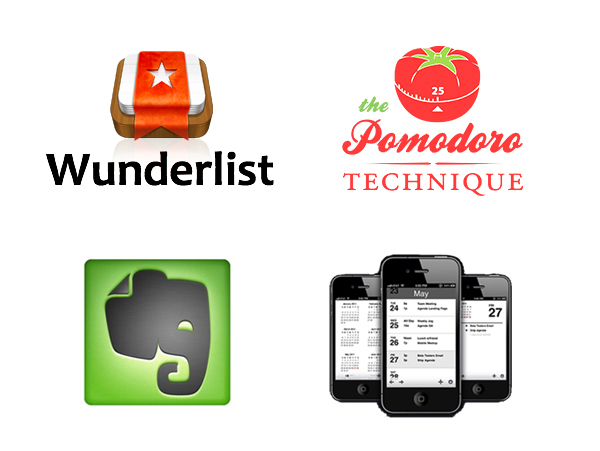 4: Evernote is rad, are you a user? I am constantly working on organizing my incoming information and it helps me capture all of my ideas in one place, and bonus I can access it remotely! I have used other similar programs in the past (and still do occasionally) but I am working on switching everything over. Why I like it : All of those desktop files, photos, clips can go in one place. I love that you have remote access, a big deal for me that is lacking in other programs I've tried. Why try? You can download it for free with a 60MB a month limit of stored information. There is a fee of $5 a month or $45 a year if you want to go premium which means you have 1 GB/mo. 5: Agenda : This is a sweet app that makes your iPhone calendar fancy. Why I like it : It is clean and simple with an old school paper calendar feel, and that it syncs seamlessly with my desktop gmail and iCalendar. Why try? If you want something different than the normal iCal app this is a great option. I believe it is $2.99. So far it is for iPhones only, sorry other phone users. Remember to share your favorite time sharing solutions, I would love to hear about them! I am a list and organization freak so this post is for me! I have been searching for something to replace my tada list so will definitely be giving Wunderlist a go. Quick question though, can you change the order of items on a list? Evernot is exactly what I'm searching for. I'm constantly looking through bookmarks. Thanks! And finally, the iphone calendar. I was thinking today that I hated the calendar. Bingo! What a timely post, thank you so much! Sarah - I'm glad you liked the post! As for Wunderlist you can just drag and drop the items around in any order you want on the desktop version. I'm not sure about the mobile versions but then you can star or also give them a due date if you want to sort them on your phone. Another nice well designed to-do app is TeuxDeux, have you heard of that one? Rachel- I have heard of TeuxDeux. I used it for awhile but can't remember what feature I was displeased with. Then I switched to TaDa but just not loving it. Thank you again! Love this post, super useful and timely for me. I've used and loved Evernote on my laptop but never on mobile, will have to try. I'm still struggling with typing to-do's into my iPhone - would love to manage things there but it always seems easier to jot things down in a small notebook in my purse (where ideas sometimes go to die). I did download an audio reminder app called Voice Secretary, thinking it would be easier and faster just to say what I need to remember into my phone, still getting the hang of it but could be helpful. Anyways thanks for the great ideas! i downloaded evernote but have yet to really get in the swing of this, is that not also a program you would use for to do lists? if you're not using it for that i wonder what it's lacking? I think about this alllll the time - where have the last few months gone? Why can't I focus? What's technology doing to my head? for checklist i like paperless. at the moment i'm using paperless lite which is free and it has all i need, but you can get the paid version too if you want. Ok I'm going to try a couple of these, but I think I might be hopeless when it comes to time management apps. I always find that there is something missing with them! Rachel-- this post feels like it was plucked from heaven and gifted to me. I am one of the most disorganized people I know. I will be downloading these apps immediately for the sake of my family and the heap of madness we live in (plus I just got my first iPhone and I need some apps). Thanks! Rachel, thank you so much! I'm really feeling like there is so much to do that I can never really settle down. I tried Evernote a year or so ago and couldn't get into it. Same with TeuxDeux. But just downloaded Wunderlist and am hoping it can work. I like using my notepad (a page per day) because it's been my system since my first job out of college. I also take meeting notes there so it's like my everything! BUT where I really struggle is with longterm lists and projects. And shopping lists! I tried SplashShopper but it's not perfect. I wish my husband and I could both add things to a list so when either one of us is out, we can stop and get what we need. I am downloading these as I type! This post couldn't have come at a better time being that I left my day job as an Art Director to strike it out on my own for a bit before we start a family. I am most excited to try Evernote!!! Last but not least, l o v e the name India. Precious. great list of apps... i've got daily notes, but it doesn't stop me from busting out pen and paper to make a "must do list". i'm going to see if i can dig up a podcast of this story, i'm really curious about what they have to say. on the flip side a few years back i heard from a friend that her workplace was a-ok with the use of facebook etc. at work b/c they found in the long run it ended up that workers were more productive. i can see how that would be true - to a point. i find my little breaks throughout the days to check sites and blogs energize me to carry on (tho some days it does get out of hand)! This is perfect for me. Wonderlist was such a great suggestion. Keep up the goodwork. Another to-do list option is Things. Expensive ($49.99), but it has exceptional features. Daily to-dos can be arranged in order. When you check them off, they're kept in a log. Easy to enter for future dates. There's a category for "someday" lists and also an excellent project organizer. Easy to use. Accessible on my iPhone (but I have to be on the same wireless network as my computer to sync).